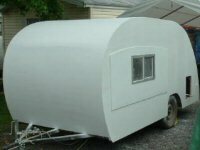 Teardrops n Tiny Travel Trailers • View topic - The Fantastic Fan Order..
fan - possibilites?? The reason I ask is there is so many models of these. could you recommend a fan for us? They are all the same thickness, it just depends on where you want it to stick out, on the inside or the outside. Mine is flush on the inside, but the top isn't too bad. I have a 1 1/8in thick roof. Finn, I think you'll really like this fan. Lots of air movement and quiet too. Hey, guys--want to tell him the dimensions he's supposed to frame the roof for that? I forget--14" something? I was looking on that fan web and it has so many different model numbers. according to the space or size of area.. I noticed some of the framing for the fan.. That looks easy enough to do. work real nicely..and a lot cheaper than those that we have available here regardless of the shipping from the USA..
Finn, even though you frame the opening 14.25 by 14.25 (I knew Madjack would know that), depending on the dimensions of your spar lumber, you may have to add extra sticks of lumber around that framing. In other words, when you go to screw the fan in, the screws may just go into air. Know what I mean? Like for mine, the 1 by 2s I used weren't wide enough, so I had to add extra 1 by 2s around it. Thank God someone told me this before I framed mine, and before I skinned. If you have your fan before you skin, you're cool, because you can test the fit. Last edited by Ira on Fri Jan 06, 2006 8:42 am, edited 1 time in total. Has anyone bought their Create-A-Breeze fan? It has the same basic features of the model 4000 (3 spd, no reverse, manual open), but is $28 cheaper. I wonder if it is as quiet, or as efficient, or will last as long. They only say it is made with different plastic, therefore cheaper. They also don't say if it is as large as the regular models, and it only comes in one model...no options for dome, profile, etc. like the standard models. Not that I am considering buying it, just wondering. I think I'm going with the 4000 low profile with white tranluscent dome. I'm not concerned with mounting, as I'm getting the fan before I construct the mounting in the roof. Even though my roof is slightly curved, my fan mount will be flat on top and bottom, and will have the thickness necessary for a nice fit with no protrusion on the inside to bump my head on. In other words, get the fan first and make the roof mount to fit the fan, not vice versa. Well since Steve Frederick put mine in for me I have no info on installation. That said, I have used it some and have two comments. First, I can't imagine needing any but the lowest speed because it really moves a lot of air in such a small space. Second, I really like the thermostat for this reason: I usually camp with a bunch of rowdy ww kayakers and like to head for bed much earlier than they do. I turn the fan on exhaust (to move air and help cut the outside noise) and set the thermostat to the highest temp for it to stay running. Usually by the early morning hours the night air has cooled and the rowdy kids have passed out--taa-daa! The fan turns itself off. Works great. Also it is my notion that these fans are designed for much larger campers and therefore move a lot of air for a TD? Others would know more about that aspect, no? I may regret later if I dont.. oh well matter of preference I guess..
Looks like they have sent them all over the world.